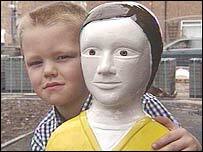 A Nottingham primary school has installed metal bollards designed to look like children to slow down motorists. The bollards - all nicknamed Billy by the children - are outside Southwold Primary School in Radford. Head teacher Kay Price says the idea is to stop cars mounting the kerb and to get them to slow down as they pass the school. Nottingham City Council ordered the six bollards at £260 each from the Great British Bollard Company in South Shields, Tyneside after a safety officer thought up the idea. Stewart Thompson, traffic and safety officer at Nottingham City Council, said: "Graffiti a possibility, but we won't mind a moustache or two. "We will see the reaction of the children and community before we decide whether to install them elsewhere." The money for the bollards comes from a government regeneration fund that is also paying for a new drop off area outside the school. Mrs Price says: "We certainly have had children knocked over and we have had a couple of serious accidents." "It is important that we teach children road safety - and anything like Billy Bollard that help children and drivers beware is absolutely great." "We want kids to adopt them as their own - they might even be painted to match the colours of the school."